Many in vitro studies have shown that adenosine (Ado) can induce vascular endothelial growth factor (VEGF) mRNA and protein expression and stimulate endothelial proliferation. In the present study, we seek to determine whether Ado can increase circulating levels of VEGF protein in the intact human. Five outpatients 49.3 ± 6.7 years of age and weighing 88.2 ± 8.5 kg were selected. They were given a 6 min intravenous infusion of Ado (0.14 mg kg-1 min-1) in conjunction with sestamibi myocardial perfusion scans. Mean blood pressure (MBP, calculated from systolic and diastolic values) and heart rate (HR) were determined before Ado infusion and every 2 min for the next 10 min. Plasma VEGF concentrations (ELISA) were determined immediately before Ado infusion and 1 h, 2 h, and 8 h after the infusion. Plasma VEGF concentration averaged 20.3 ± 2.0 pg ml-1 prior to Ado infusion, and increased to 62.7 ± 18.1 pg ml-1 at 1 h post- infusion (p < 0.01). VEGF plasma concentration returned to basal levels 2 h after infusion (23.3 ± 3.4 pg ml-1). MBP averaged 116 ± 7 mmHg and heart rate averaged 70 ± 7 prior to Ado infusion. MBP decreased by a maximum of ~22% and HR increased by a maximum of ~17% during the infusion. We conclude from these preliminary findings that intravenous infusion of adenosine can increase plasma levels of VEGF in humans. It is well-established that adenosine is an important physiological regulator for maintaining oxygen homeostasis in the heart (Berne, 1980; Ely & Berne, 1992). Adenosine formation increases when the oxygen requirements of the myocardium exceed the oxygen supply, which leads to an increase in adenosine levels in the tissues (Sparks & Bardenheuer, 1986; Duessen et al. 1988). The adenosine released under these conditions is thought to play an important role in reestablishing a balance between oxygen supply and demand (Schrader, 1990) by virtue of its potent vasodilatory (Stepp et al. 1996) and anti-adrenergic effects (Neumann et al. 1995; Dobson et al. 1986). Mounting evidence suggests that adenosine may also have a long-term role to increase tissue oxygenation by stimulating angiogenesis (Teuscher & Weildich, 1985; Adair et al. 1990; Ethier et al. 1993; Marshall, 2001; Adair, 2005). Adenosine can stimulate endothelial proliferation in vitro (Meininger et al. 1988; Ethier & Dobson, 1997; Grant et al. 1999; Gu et al. 1999) as well as angioge nesis in a variety of in vivo models (Adair et al. 1989; Adair et al. 1991; Adair, 2005). Although the angiogenic effects of adenosine are poorly understood, it is known that adenosine, mediated by way of adenosine A2 receptors can upregulate VEGF mRNA and protein expression in many different cell types (Hashimoto et al. 1994; Takagi et al. 1996; Grant et al. 1999; Gu et al. 1999; Gu et al. 2000; Feoktistov et al. 2002; Leibovich et al. 2002; Feoktistov et al. 2003; Gardener & Olah, 2003). Numerous investigators have postulated that this adenosine-mediated expression of VEGF might have a role in mediating adenosine-induced angiogenesis ; however, it is still not clear whether adenosine can induce VEGF expression in the intact organism. 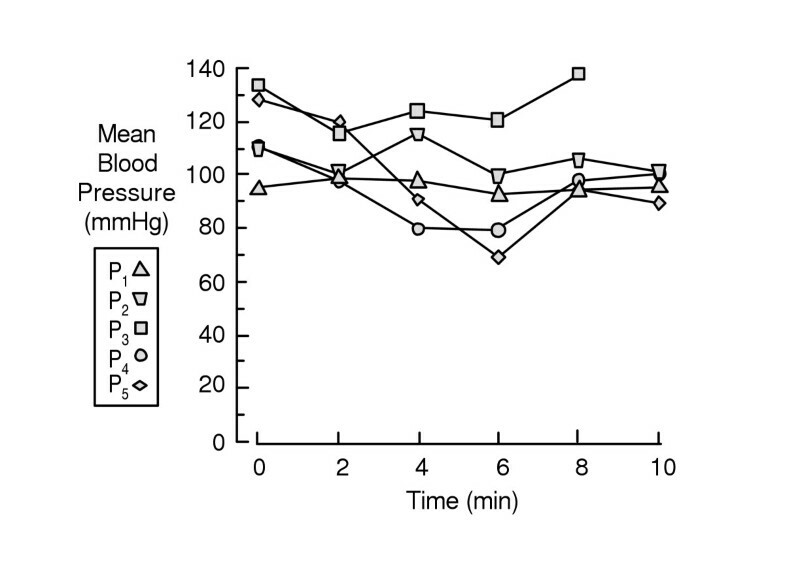 The intravenous infusion of Ado (0.14 mg kg-1 min-1 for 6 min) caused the plasma levels of VEGF protein to increase (P1–P5) one hour after the infusion (Figure 1a). However, the VEGF response to Ado varied greatly among the subjects ranging from a 21% increase (P1, 15.6 pg ml-1 to 18.9 pg ml-1) to a 329% increase (P5, 25.6 pg ml-1 to 110.1 pg ml-1), as shown in Figure 1b. Plasma VEGF protein levels averaged 20.3 ± 2.0 pg ml-1 before the infusion, and increased to an average of 62.7 ± 18.1 pg ml-1 (p < 0.05) one hour after the infusion. VEGF protein levels returned to control values by 2 h after the Ado infusion (23.3 ± 3.4 pg ml-1) and remained at control levels at 8 h post- infusion (24.3 ± 7.0 pg ml-1), as shown in Figure 1a. 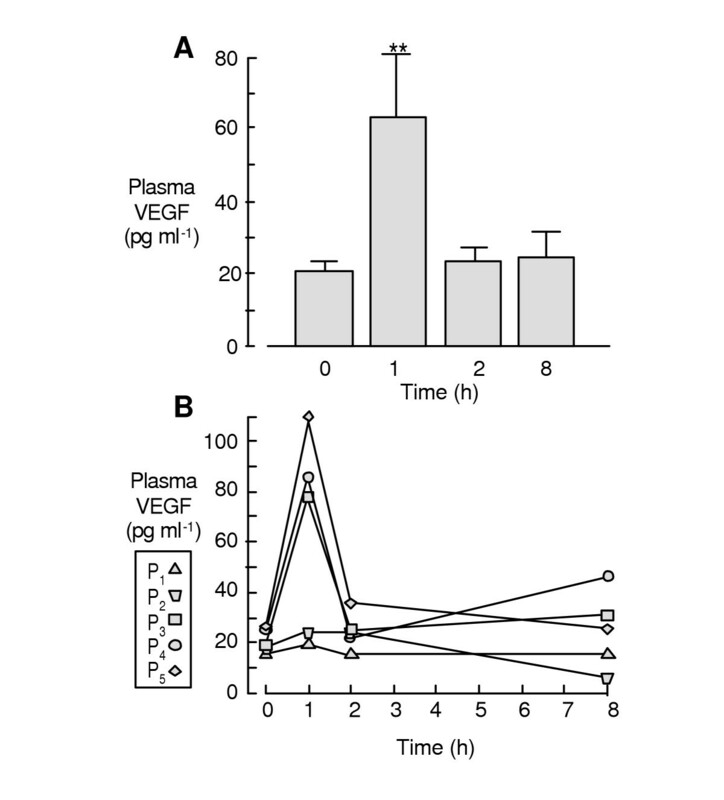 Effect of adenosine on plasma VEGF protein concentration. Adenosine (0.14 mg kg-1 min-1) was infused intravenously for 6 minutes at 0 h. Panel A: Adenosine caused plasma VEGF protein concentration to increase by an average of ~3-fold at 1 h post-infusion. Plasma VEGF protein levels at 0, 1, 2, and 8 h were 20.3 ± 2.0, 62.7 ± 18.1, 23.3 ± 3.4, and 24.3 ± 7.0 pg ml-1, respectively. Panel B: Adenosine caused plasma levels of VEGF protein to increase in all 5 subjects one h after the infusion; however, the response was relatively small in two subjects. Bars are means ± S.E.M. (n = 5 for each bar). Asterisks indicate p < 0.01. The infusion of Ado caused MBP to decrease in most of the subjects (Figure 2), ranging from a 1 mmHg decrease in P1 (control MBP, 94 mmHg) to a 59 mmHg decrease in P5 (control MBP, 128 mmHg). This maximum decrease in MBP occurred after 2 minutes of Ado infusion in two subjects (P2, P3) and after 6 min of infusion in three subjects (P1, P4, P5). Note on Figure 2 that MBP did not decrease below 69 mmHg in any of the subjects. Mean blood pressure (MBP) was calculated from systolic and diastolicpressures for the 5 patients (P1–P5). MBP was measured before Ado infusion (time 0), and then every 2 min for the next 10 min, except in P3 in which a 10 min MBP was not obtained. Ado infusion caused MBP to decrease at some point during the infusion in all subjects, but the pressure did not decrease below 69 mmHg in any of the subjects. The decrease in MBP was associated with decreases in both systolic (SBP) and diastolic (DBP) pressures (Table 1). Note also on Table 1 that adenosine increased heart rate (HR) significantly during the period of infusion. This increase in HR is typically seen in human subjects infused with adenosine and is thought to be a reflex response to the fall in blood pressure. Acute cardiovascular effects of adenosine infusion. Heart rate (HR, beats per minute), systolic blood pressure (SBP, mmHg), diastolic blood pressure (DBP, mmHg) and mean blood pressure (MBP, mmHg) were measured before Ado infusion (0 min) and then every 2 min for the next 10 min. MBP was calculated from SBP and DBP. Values are means ± S.E.M. (n = 5 at all times, except at 10 min where n = 4). * indicate p < 0.05. ** indicate p < 0.01. The results have shown that adenosine can increase plasma levels of VEGF protein in humans. The intravenous infusion of adenosine caused a three-fold increase in plasma VEGF protein levels one hour after the infusion (Figure 1a). Previous studies have shown that exogenous administration of adenosine or adenosine agonists (Hashimoto et al. 1994; Fischer et al. 1995; Takagi et al. 1996; Pueyo et al. 1998; Grant et al. 1999; Gu et al. 1999; Grant et al. 2001; Leibovich et al. 2002; Gardener & Olah, 2003; Feoktistov et al. 2003) or upregulation of endogenous adenosine (Gu et al. 2000) can enhance VEGF protein and/or mRNA expression in a variety of cultured cells (for review, see Adair, 2005). However, the present study is the first, to our knowledge, that demonstrates that the infusion of adenosine can increase circulating levels of VEGF in vivo. The known cardiovascular effects of adenosine are mediated by the A1 and A2 (subtypes A2A and A2B) receptors (for review see Shryock & Belardinelli, 1997; Ralevic & Burnstock 1998; Rongen et al. 1999). Responses to activation of the A1 receptor include slowing of the heart and slowing of impulse conduction through the atrioventricular node, reduction of atrial contractility, inhibition of beta-adrenergic effects, and vasodilatation (Bryan & Marshall, 1999). Activation of A2 receptors causes (a) vascular smooth muscle relaxation (Belardinelli et al. 1998; Ngai et al. 2001; Hinschen et al. 2003), which can lead to decreases in blood pressure, and (b) induction of VEGF expression from a variety of cell types (Hashimoto et al. 1994; Pueyo et al. 1998; Grant et al. 1999; Gu et al. 1999; Leibovich et al. 2002; Gardener & Olah, 2003; Feoktistov et al. 2003). Recent development of selective agonists and antagonists for A2 receptor subtypes suggests that vasodilatation is mediated by A2A (Shryock & Belardinelli, 1997; Belardinelli et al. 1998; Rongen et al. 1999) and perhaps A2B receptors (Ralevic & Burnstock 1998; Ngai et al. 2001; Hinschen et al. 2003). The A2B receptor subtype appears to mediate the induction of VEGF protein and mRNA in various human cell types. Grant et al. (1999) have shown that activation of the adenosine A2B receptor (but not the A2A receptor) can increase VEGF mRNA and protein expression in cultured human retinal endothelial cells. Feoktistov et al. (2003) established that adenosine acting by way of the A2B receptor can stimulate VEGF expression in human mast cells. These latter investigators (Feoktistov et al. 2002) also showed that adenosine can induce VEGF expression in human microvascular endothelial cells, where A2B receptors are abundant, but not in human umbilical vein endothelial cells, which preferentially express A2A receptors. Therefore, the available data suggest that adenosine induced vasodilatation and VEGF expression could be mediated to some extent by similar receptors. It is not clear from the present study whether the infusion of adenosine actually induced the transcription and translation of VEGF ; however, it is known that both VEGF mRNA and protein can be induced within a one hour period of time. Breen et al. (1996) found a fourfold increase in VEGF mRNA at the termination of a one hour bout of treadmill exercise in rats. Gu and Adair (1997) showed that exposing dog myocardial vascular smooth muscle cells to a hypoxic environment caused a twofold increase in VEGF protein concentration in the media after only one hour of exposure to the hypoxic environment. Therefore, it is conceivable that adenosine could induce VEGF transcription and translation resulting in elevated plasma levels of VEGF at one hour post infusion. However, additional studies will be required to determine whether the increase in circulating VEGF caused by adenosine did in fact result from adenosine-induced production of VEGF. A possibility that must be considered is that the transient decrease in blood pressure caused by adenosine leads to transient hypoxia in the tissues, and that the hypoxia, in turn, leads to the induction of VEGF expression. Hypoxia is a well-known stimulus for the induction of VEGF expression both in vitro and in vivo (for review see Ferrara & Davis-Smyth, 1997; Ferrara, 2001). However, it seems unlikely that this indirect induction of VEGF by adenosine could explain entirely the results of the present study for the following reasons: (a) adenosine can induce VEGF mRNA and protein expression in vitro where blood pressure is not an issue, as discussed previously; (b) adenosine increased the plasma levels of VEGF in two patients in whom the blood pressure had decreased by less than 15 mmHg, a decrease that should not cause significant perfusion problems or hypoxia in the tissues; (c) mean blood pressure did not fall below 69 mmHg in any of the subjects; and (d) none of the subjects experienced symptoms suggestive of cerebral hypoxia during the infusion of adenosine. All subjects were supine during the infusion of adenosine to minimize potential perfusion problems. Furthermore, adenosine induced vasodilatation would be expected to improve the distribution of oxygen within a tissue, also arguing against tissue hypoxia. Therefore, it is unlikely that the adenosine induced decrease in blood pressure contributed significantly to the rise in VEGF. In conclusion, this study provides preliminary data showing that an intravenous infusion of adenosine can increase plasma levels of VEGF in humans. Additional studies will be required to determine whether the increase in plasma VEGF caused by adenosine results from the transcription and translation of VEGF. The study protocol was approved by the University of Mississippi Medical Center Internal Review Board. The subjects underwent routine sestamibi myocardial perfusion scans because of suspected coronary artery disease. They consisted of one man and four women; mean age was 49.3 ± 6.7 years and mean weight was 88.2 ± 8.5 kg. None of the subjects had taken caffeine prior to the test, had a history of asthma or myocardial infarction, or were being treated with blood pressure medications. Their mean blood pressure (MBP, auscultatory sphygmomanometry) prior to testing was 116 ± 7 mmHg (systolic, 159 ± 12 mmHg; diastolic, 94 ± 5 mmHg). MBP was calculated as the diastolic pressure plus one third of the pulse pressure. Mean heart rate was 70 ± 3 beats per minute; one patient (P4) was paced at 66 beats per minute. Also, one individual (P3) had a history of multiple myeloma and was being evaluated for kidney transplantation. Adenosine (Adenoscan®, Medco Research, Inc.) was infused intravenously at 0.14 mg kg-1 min-1 for six minutes (i.e., total dose was 0.84 mg kg-1). MBP was measured before the adenosine infusion and then every two minutes for the next ten minutes. Technetium-99 (sestamibi) was administered three minutes into the adenosine infusion and a nuclear scan was performed. The infusion of Ado was well tolerated by all subjects. There were no significant ECG abnormalities during the test and no myocardial perfusion abnormalities were found. None of the subjects were diagnosed with cardiovascular disease. Three mL of blood were collected in EDTA coated tubes before the adenosine infusion and at 1, 2, and 8 h after the adenosine infusion. The blood samples were centrifuged at 700 g for 5 minutes at 4°C, and plasma was stored at -80°C. Plasma levels of VEGF were measured in duplicate by sandwich ELISA (R&D Systems, Minneapolis). In these assays, the test sample is sandwiched between a monoclonal antibody against human recombinant VEGF. A second polyclonal antibody against VEGF is conjugated to horseradish peroxidase and then added to the mixture. Color develops by addition of hydrogen peroxide and chromagen tetramethylbenzidine, and the intensity is measured at 450 nm. VEGF plasma protein levels (pg ml-1) were calculated using an equation generated from the regression analysis of standard VEGF concentrations. The results are expressed as means ± standard errors of the mean (S.E.M.). Differences between the groups (e.g., plasma VEGF at various times) were compared using analysis of variance for repeated measurements and Dunnett's multiple comparison test (InStat, GraphPad Software, Inc.). The work was supported by a grant from the National Institutes of Health HL51971. Thomas H. Adair, Jean-Pierre Montani, and Reid Cotten designed the study. Reid Cotten, Kenneth R. Bennett, and Michael R. McMullan performed the myocardial perfusion scans and collected the blood samples. Thomas H. Adair, Jian-Wei Gu, Janelle S. Pryor, and Preston B. McDonnell performed the various analyses. All authors contributed to writing the manuscript.